As you probably already know, countertops come in a variety of material, ranging from laminate to a higher-end granite. Recycled glass, a material gaining quickly in popularity, is not only environmentally friendly, but it’s also considered to be quite durable and pleasing to the eye with its colorful and mosaic-like look. Made from 100% post-consumer recycled glass that is held together with a binding-type agent such as a cement or resin, recycled glass countertops comes primarily from curbside recycling, but some manufacturers use salvaged glass as well. The costs of a recycled glass countertop will greatly depend on so many factors, which we will discuss below, but on average, the costs of a basic glass countertop, including professional labor, can cost about $40 per square foot, whereas a premium countertop with customizations can cost closer to $110 per square foot or even more, depending on the contractor you work with. Aside from the factors we discuss below, your geographical region, the contractor you hire and where you get your countertops can all play a role in the final price. With so many factors involved, it’s hard to give an exact cost, and for that reason, we highly recommend you check out the free tool, HomeAdvisor.com. Here, you simply explain your project, details and what you’re looking for, and with this information, locally licensed contractors will contact you with a free quote. No credit card is needed and this is a great way to receive multiple quotes without having to do a lot of research. Angie’s List, in its interview with a local builder showroom, said the costs range from $51 to $113, all depending on the brand, color, rarity and the size of the glass pieces. Consumer Reports states the average slab can cost $60 to $120 per square foot installed. With recycled glass countertops, as with most countertops, there will be many variables which can greatly affect the costs. If you’re shopping for this type of countertop, here are a few variables which may affect your final price tag. The size/thickness – The thicker the slab is, the higher the costs may be due to the increased material and labor costs. Edge upgrades – Many of the quotes you do receive from a local contractor will be for a basic edge only, and if you want to upgrade this edge, then you should be prepared to increase the cost, depending on the type of edge you want. Matching the seams – Since recycled glass countertops are so unique and every slab will be so unique, it can often be hard to match up the seams when more than one slab is used. If your setup will have seams and you want the slabs to blend as naturally as possible without being noticed, then this can cost more as the labor can be quite extensive. Additional cutouts for sinks, etc. – Sinks and other utilities that need to be cut out when the countertops are laid can affect the cost as some contractors will charge separately for each cutout, while some may include a basic sink cutout in their quote. Always get all of your inclusions in writing before placing a deposit. Corner upgrades – Basic recycled glass counters will not come with rounded or curved corners, and like the edges, if you wish to upgrade this area, then you can expect the costs to rise due to the increased labor costs. Rarity – As mentioned, all recycled glass countertops will be so unique, and if you have your eyes set on a particular design, color, and/or pattern, then you should be prepared to pay a premium price for a rarer color. All countertops will require some sort of maintenance and recycled glass counters are no exception. Even though recycled glass counters are heat resistant and can hold hot pots, it’s still best to get into the habit of using a hot pad to avoid any sort of thermal shock — a sudden expansion which could contract the material, causing damage. Like the hot pads, recycled glass counters will not scratch as easy as other materials, but as a habit, it’s always wise to use a cutting board when cutting any food. Whether the counter is resin- or cement-bound, keeping the counter is clean — simply wipe it down daily with a non-toxic cleaner with a soft cloth. Try to avoid any harsh cleaners as it can often damage the finish. Granite, a natural stone often made up of quartz or mica, is quarried in larger pieces before it’s cut into slabs and sent off to a local distributor. As it’s natural, no two pieces will look the same. Just like glass being “natural” in a way, it’s made of everything glass-related, ranging from older bottles to windows and light bulbs, making no two slabs the same as well. During the process, all of the glass is crushed, melted, recolored and then fused together with either a resin or cement to create the countertop slab. Coming in a wide variety of colors, just like granite, the choices are quite endless. Appearance Lighter in color with small pieces of glass specks strewn throughout the slab. Most clear, the size of the glass specks can range from as small as a pin to as thick as a coin. Ranges from a darker to lighter color and will have a tighter, granular look to it and/or filled with colorful veins. Being unique, no two slabs will be the same. Maintenance Depending on the counter is bound, cement-bound counters will require sealing annually, while resin-bound counters won't. Being a natural stone, a stone cleaner is required to avoid staining. It also needs to be stained at least every two years to avoid any discoloration. Repairs If a piece were to break off, it could cause some harm as it would be similar to that of a piece of glass breaking. While an epoxy can help, the glass within will be no different than a glass shard. If a piece were to chip off, it could be glued back on using a strong adhesive, but if ignored, it can be quite rough to the touch. Some of the most popular brands on the market include Vetrazzo, EnviroGlas, Bottle Alley Glass, Curava, The Green Building Center and in some cases, buyers may be able to find a local company that’s able to create these types of counters from locally sourced materials. While a recycled countertop does not have a specific “grade,” per se, it does have a green rating in most cases. A 100% recycled material-based countertop, for example, will be made from 100% recycled glass and only homogenous recycled glass countertops can claim this status. 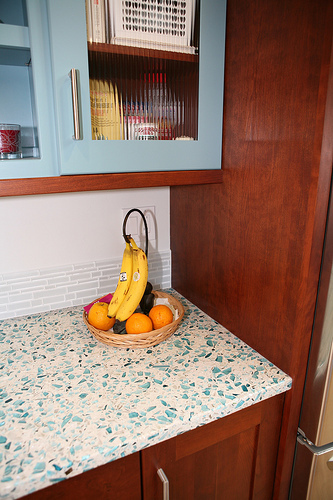 A recycled glass countertop made from either a cement or resin binder may not be 100% eco-friendly as some of the resin used during the production process will not be made from eco-friendly products; however, this is not always the case as some companies still use materials from a landfill, for example, during the process. Lastly, in the case of a brand new resin not used from any recycled materials, then it’s often made from up to 75% recycled material in most cases.